When you pray do you pray wholeheartedly or just as a suggestion to the Lord? Karlton shares. “Then Jesus told His disciples a parable to show them that they should always pray and not give up. He said: ‘In a certain town there was a judge who neither feared God nor cared what people thought. And there was a widow in that town who kept coming to him with the plea, “Grant me justice against my adversary.” ‘For some time he refused. But finally he said to himself, “Even though I don’t fear God or care what people think, yet because this widow keeps bothering me, I will see that she gets justice, so that she won’t eventually come and attack me!”‘” (Luke 18:1-5). My little dog knows how to be persistent. When he begs for food he will get right in front of my face and stare at me intently. And if that does not work for him, he will thump me on the leg with his paw just to make sure he has my attention. It can become easy to get discouraged when we find our prayers are not answered. We suffer and struggle and despite our earnest prayers the heavens seem silent. Yet Jesus tells us to keep asking, to be persistent. We need to keep asking, and God will reward our persistence. We may not get everything we want exactly as we want it, but God will give us an answer, open a door, or make a way through with whatever need is pressing upon us. When you are tempted to get discouraged because the Lord seems to be ignoring your prayers, pray again, and again. Show the Lord you are serious and that you are not going to stop praying until He answers. Our illnesses can wear us down to the point we are weary of praying, tired of seeing no changes to our circumstances, and it would be easy to just quit praying. But ask, be persistent. You may not get everything you ask for, but God will give you comfort, grace, guidance, and He will reward your persistence. Prayer: Dear Lord, we are waiting, and we are asking: Please answer our prayer. Amen. Karlton Douglas lives in Ohio with his lovely wife. At times it seems the Lord will never answer his prayers, but the Lord has always come through in the end. Do the heavens seem stony and silent? Are you tired of praying and seeing no results? Don’t give up, show the Lord you will not quit asking until He answers you. 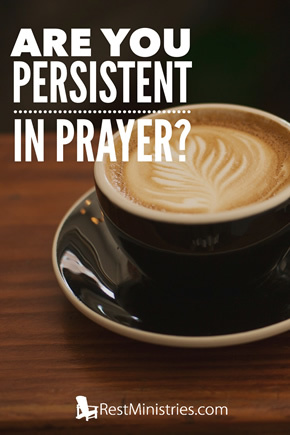 One Response to Are You Persistent In Prayer? I just found this site tonight. I’ve been dealing with Chronic pain for a very long time, and I’ve reached bottom… no, more than just bottom. I have absolutely nothing left to give. Thank you for this.